The Junior League’s Holiday Market is underway at the Augusta Convention Center at the Marriott in downtown Augusta. Read more. Kids can learn about healthy cooking and eating at the Junior League of Augusta’s Kids in the Kitchen event on Nov. 1. Read more and watch the segment. AUGUSTA, GEORGIA (September 15, 2014): The Junior League of Augusta, Georgia will host its 10th Annual Golf Tournament and 19th Hole Party on September 19th, 2014 at Jones Creek Golf Club in Evans, Ga. Tournament registration begins at 11am with a shotgun start at 1pm. The 19th Hole Party begins immediately following the tournament and includes dinner provided by Buca di Beppo, a live band and silent auction. This event supports the Junior League of Augusta’s mission of impacting the lives of families in need in the Central Savannah River Area. It is through events such as the Annual Golf Tournament and 19th Hole Party that the Junior League of Augusta is able to provide the community outreach programs and volunteer hours to the area. The Junior League of Augusta is committed to building a better community and has provided more than $2 million dollars and countless volunteer hours to its community outreach programs, grant programs and advocacy efforts. Since 2000, the volunteers of the Junior League have dedicated over 9,000 hours of volunteer work in the community, enriching the lives of over 10,000 children, their families and 3,000 adults. AUGUSTA, GEORGIA (August 5, 2014): The Junior League of Augusta, Georgia will host its 10th Annual Golf Tournament and 19th Hole Party on September 19th, 2014 at Jones Creek Golf Club in Evans, Ga. Tournament registration begins at 11am with a shotgun start at 1pm. Foursomes are available for purchase for $500 and include: Tournament play for four (4), lunch from Checkers, beverages and snacks on the course (all beverages included), prizes for the winners, and tickets to the 19th Hole Party. The 19th Hole Party begins immediately following the tournament and includes dinner provided by Buca di Beppo, a live band and silent auction. To purchase a tournament foursome, or to sponsor or donate items to the 19th Hole Party, please contact golf@jlaugusta.org or by calling 706.736.0033. Grants will be awarded in any amount up to $500. AUGUSTA, GEORGIA (5/28/2014): The Junior League of Augusta, Georgia, is now accepting applications for their annual Award for Classroom Enrichment (ACE) grants. The grant, sponsored by the Junior League of Augusta, Georgia, provides funding for creative teaching projects and is available to all teachers in the Central Savannah River Area. Grants will be awarded in any amount up to $500. To apply for an ACE grant, you must complete the official application and return it by 5 pm, August 1, 2014, to the Junior League of Augusta office at the below address. Any grant proposal submitted after 5 p.m. on August 1, 2014 will not be accepted. Applications are available on the Junior League of Augusta website, jlaugusta.org or by clicking here. Projects should be implemented during the 2014-2015 school year. All applications should be a lesson with activities with students, not just a request for supplies and materials. The ACE grant should be completed by interested teachers and not assigned or used as a college project or an assignment that will result in any type of credit, a grade, an evaluation or extra credit for a teacher. Failure to comply with this rule will result in denial of eligibility to participate in this program. Mandi Peebles, Legislative Coordinator for JLA, traveled to Atlanta on March 6th for “Capitol Day.” Capitol Day is organized by the State Public Affairs Committee of the Junior Leagues of Georgia (SPAC), of which our league is a member. 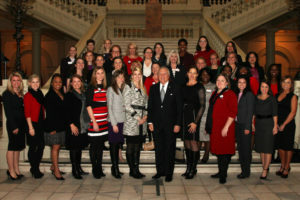 The State Public Affairs Committee of the Junior Leagues of Georgia monitors state and federal legislation, and addresses important advocacy issues based on member League’s projects and efforts. GA SPAC is made up of delegates from 12 Leagues in Georgia and their collective voice represents approximately 10,000 women. Bills that GA SPAC advocated for during Capitol Day can be found here: 2014 GA-SPAC Legislative Agenda.